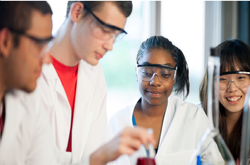 The University of Alabama (UA) Robert Noyce Summer Internship and Scholar- ship/Stipend Program funded by the National Science foundation, is designed to increase the number and diversity of graduating teachers certified in chemistry, physics, and mathematics, and teaching in Alabama. internship will occur over 4 weeks, June 4-28, Monday thru Friday each week Intern students, who require housing, will live on the UA campus and attend numerous activities related to chemistry, physics and mathematics. A weekly stipend of $450 will be given to cover living costs on campus and support interns for their time. Selection will be made by the UA Noyce Scholar selection committee.